When it comes to plumbing, choosing the right fittings and tubing for your pipes is very important. Installing the incorrect features can result in an onslaught of issues, ranging from corrosion to downtime or even injury. 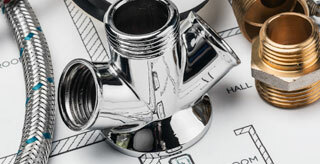 Learn how to choose the right tubing and fittings for your plumbing applications with our guide. Pipes are the foundation of all plumbing systems. Without them, materials wouldn’t be able to move in and out of residential and commercial applications. But conduits don’t work alone; they require added fixtures that play vital roles in plumbing operations. Two of those features are tubing and fittings. Fittings are fixtures used to connect other pipes and tubes. They come in a countless amount of materials, shapes and sizes and are used to attach, join or lengthen pipes. For example, if a system needs to wrap around a corner and doesn’t have the right shape to do so, the right fitting can be placed to safely and securely connect two pipes. Tubing is similar in the look and style of a pipe itself but tube fittings are typically only used for structural purposes. Unlike pipes, these fixtures aren’t used for the transfer of liquid or gas and their defining sizing specification is the outside diameter. There is a wide selection of pipe tubing and fittings, but finding the right type for your pipes is essential to a working plumbing system. The most important consideration when selecting tubing and fittings is fixture compatibility. Without this, your plumbing applications won’t operate efficiently. Here’s the kind of criteria you need to look out for when choosing pipe tubing and fittings. Since pipes aren’t made from only one material, it’s to be expected that the same goes for fittings and tubing. The use of material for fittings depends on several different factors, including temperature conditions, pressure ratings, cost, etc. However, both fittings and tubing components are typically matched with the material of the pipe itself. The most common materials for fittings are metals and plastics, including brass, copper, steel, black iron, polyvinyl chloride, high-density polyethylene and more. For tubing, material selection plays a huge role in determining the right kind for your application. Hard, metal tubing is used when pipes need strength and hardness. Copper, aluminum and steel are the most commonly used metals for tubing. These materials are frequently used in plumbing and heating applications for their corrosion resistant durability. Soft tubing is a more flexible alternative in plumbing systems. The most commonly used plastics are nylon, polyethylene, polypropylene, polyurethane and polyvinyl chloride. Soft tubing offers corrosion resistance, strength and helps reduce pressure leaks. The proper sizing is essential to a successful fitting and tubing selection. Fitting size is determined by the inside diameter (ID) and outside diameter (OD) of its corresponding connections, measured in inches or millimeters. ID measures the size of the empty portion of the cylinder, and OD sizes the thickness of the tubing wall. Tubing size is somewhat similar. Also measured in inches or millimeters, the dimensions for tube sizing is determined by the OD, ID and wall thickness, but nominal sizes for tubes are based on the outside diameter. By carefully and correctly selecting the proper tubing and fitting, your plumbing systems will be able to operate at peak performance.